Oh no. Noisy holiday rolling around again, and your dog is scared of fireworks? Even though it’s just a few days before the holiday, you can make a plan and take action to help your dog be a bit less afraid of the unpredictable scary sounds of fireworks, firecrackers, whistles, and even guns. Here are some things you can do today. Make (or adapt) a safe place for your dog. Keep in mind that the flashes of light that come with big fireworks displays can be scary too, so consider a method to temporarily darken any windows nearby. Experiment with sound masking and/or music to find out what is the most helpful for your situation. There are two contrasting methods here. Some people find that slow, quiet classical or easy listening music is soothing to their dogs. 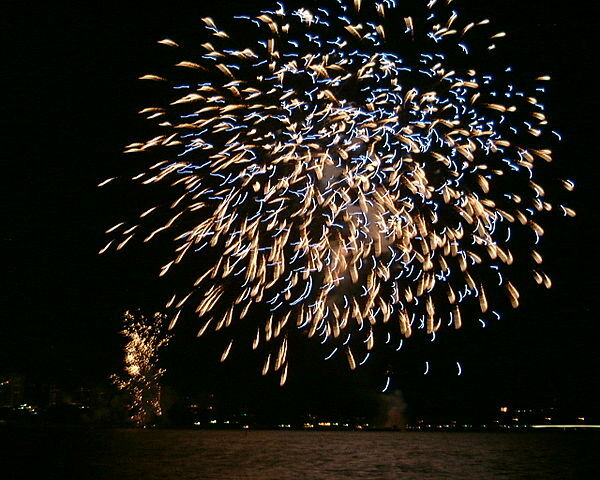 If you have already found that to be so, use it, but don’t try it out for the first time when the fireworks are going on. It does not work for all dogs, and you might even get “reverse conditioning” and make playing music scary to your dogs if it predicts fireworks. The other method is to use some kind of recorded white noise, natural noise, or louder music to mask the pops and booms. (Even a noisy food toy can be helpful.) This “mechanical” approach is more to my liking. And here’s a tip: the lower the frequencies included in the masking or music, the better it can hide those low-pitched booms. So if your dogs are already habituated to pounding rock music or some other music with a lot of bass or percussion, play it! It can mask some of the scary noises from outside your house more effectively. I have a taiko drumming CD that is great for this. But if you try that, be absolutely certain that the music on the CD itself doesn’t scare your dogs first. If they are already sensitive to booms, it probably will. You’ll need to find the line of best fit for your dogs. Make a plan for taking your dog out to potty. Do you know when the noise is usually at its worst and can you work around that? Are your fences and/or leash and harness secure? Otherwise sedate dogs have been known to panic and run off on noisy holidays. Don’t let that happen. Keep your gates locked, your dogs’ collar or harness and ID tags on, and put some redundancy into your safety system. LOSE that idea that you should make your dog “tough it out.” There is absolutely nothing to be gained from that. In fact, it’s fine to comfort your dog if that helps her. You can’t reinforce the emotion of fear, and helping a dog through a tough time is not “coddling.” (It is quite possible to reinforce behaviors associated with fear, but that is a subject for another post. A few days before scary noises are due is probably not the time to start working on that.) Assess what is most helpful to your dog: a cuddle, some lap time, a ride in the car, being in her crate with a food toy, or hiding by herself in a secluded place. Then help her do it. 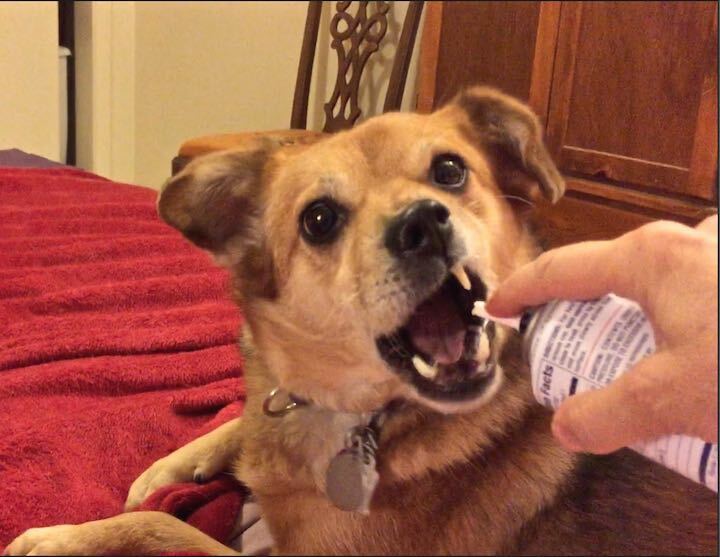 If your dog’s fears are severe, talk to your vet about medication. There are short-term, situational medications that can help your dog relax. (NOT Acepromazine.) Your vet may also discuss some longer term medications. Thanks for reading! I hope you can help your dog feel as safe as possible. 1. ↑ NOTE: You may wonder why I am not recommending buying an app or CD with fireworks sounds to “practice” with. Performing desensitization/counterconditioning with sounds is tricky. The chances of getting successful conditioning in a few days are slim, and there will be a huge tendency to rush. People who haven’t done DS/CC before are far more likely to scare their dogs further than to help them. This is why I am recommending only Step 1 above, which consists of counterconditioning without systematic desensitization, using environmental noises that were going to happen anyway.